FIC is happy to share with you the fourth volume of our Best of Communities Collection. Meetings are a big part of community life. They are where the most important decisions are made, where we work constructively to build ideas and to solve problems, and where all of our rational thinking and our emotional/intuitive wisdom are needed. Community meetings tend to be more complex than meetings in the mainstream world: we bring to the table our real personalities and we want to give equal voice to every participant, without enacting power dynamics. We would like to be fast, effective, and respectful of everyone’s opinions, and we also hope to minimize upset feelings. It’s not a simple task to run a successful (and peaceful) community meeting. There is not one single format that works best for all or in all situations, but in this bundle we have collected 21 of our best articles, carefully extracted from Communities magazine, to get you inspired. 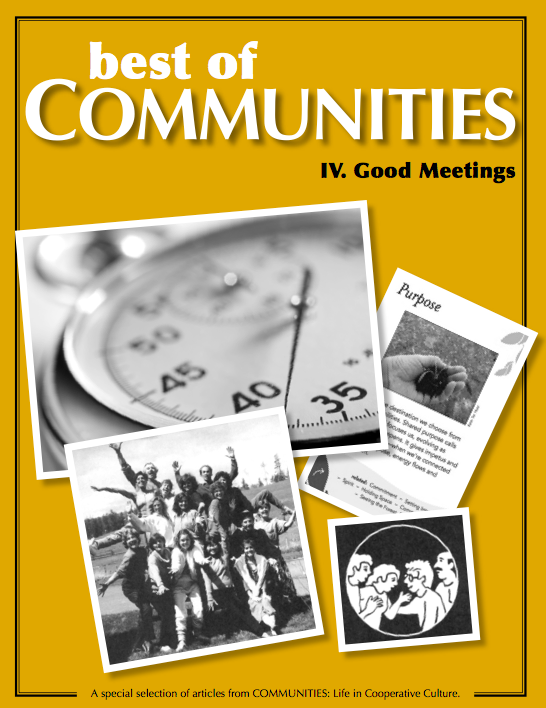 You can buy this digital downloadable PDF volume of the Best of Communities collection for only $10! 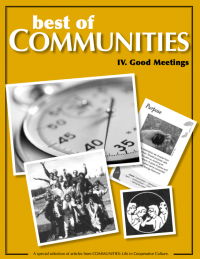 Our Best of Communities volumes are special collections of articles published by the FIC, in which we have distilled what we consider to be the most insightful and helpful articles that have appeared over the last 20 years in Communities magazine and the print book Communities Directory. We have divided our choices into 15 collections, each one on a topic that you―our readers―have told us you care about most: seeking and visiting communities, agreements, conflict and communication, children in community, communities for elders, cohousing and many others. Each collection contains about 20 articles and they are all available as digital downloadable PDFs. You can buy this volume of The Best of Communities collection for only $10! All 15 issues of this collection can be found here, sold individually or in a bargain-priced bundle.